Register NOW for Home, Lawn and Garden Day - a day of gardening fun and learning! 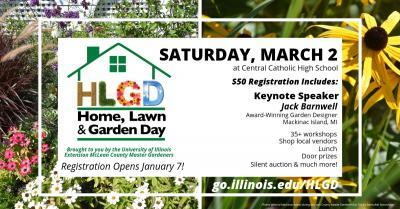 BLOOMINGTON, Ill. – University of Illinois Extension McLean County Master Gardeners would like to invite you to their 17th annual Home, Lawn and Garden Day on Saturday, March 2 at Catholic High School in Bloomington. Home, Lawn and Garden Day is a day dedicated to garden fun! It is an ideal place to get inspiration for future garden projects, fall in love with a must-have plant or learn the basics of everyday gardening. McLean County Master Gardeners host their annual Home, Lawn and Garden Day just in time to beat the winter blahs. Register at the University of Illinois Extension website at go.illinois.edu/HLGD or stop by the McLean County Extension Office (1615 Commerce Parkway, Bloomington) beginning January 7. This year's Home, Lawn and Garden Day is packed full of gardening speakers and workshops including keynote speaker, Jack Barnwell. Jack is a landscape contractor, author, and award-winning garden designer based on Mackinac Island, Michigan. As the owner of Barnwell Landscape and Garden Inc., Jack has over 20 years of experience creating breathtaking commercial and private garden displays in one of the world's premier summer vacation destinations. As a consultant for Proven Winners, he contributes to the design of beautiful gardens at prestigious properties all over the US. During his presentation, he will share the best techniques for design, plant selection, and maintenance practices that create stunning displays of color and form, while minimizing care so that anyone can handle it! The day will open with a presentation for all by Dr. David Kopsell, Assistance Chair, and Professor of Horticulture in the Department of Agriculture at Illinois State University. During his presentation titled "Landscape Design Tips, Techniques and Secrets" you will learn some basic design principles, color and shape combinations, and plant choices to help make your yard look amazing. You will leave with the skills and knowledge to transform any outdoor space like a pro! During the mid-day session, Master Gardeners that you often hear on WJBC radio will have a question and answer segment of questions submitted by attendees. Researched-based solutions will be presented, combined with fun and practical advice! Don't forget to submit your questions during the online registration process. The fee for this day-long program is $50 and includes, the welcome and keynote sessions, choice of three additional break-out sessions, morning refreshments, and lunch. Hands-on workshops may have additional costs to cover materials that may be used. With over 35 break-out sessions to choose from, there is sure to be something for every kind of gardener. Some of the breakout sessions offered include shade gardening, pruning, Mason jar terrariums, pollinator plants and habitat, native plants, raised bed vegetable gardening, and garden photography. See more workshop choices online during registration. There will also be plenty of time to visit and shop with the many exhibitors. It is an excellent opportunity to meet and talk with local garden center representatives about new products or to purchase a garden treasure. There will also be a silent auction this year to support the McLean County Master Gardeners community projects. For questions about the program, please contact us at (309) 663-8306. Workshops fill up fast, reserve your spot January 7! 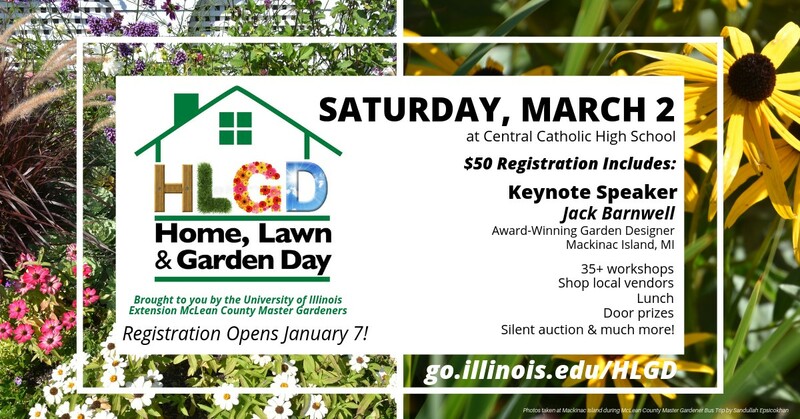 If you need a reasonable accommodation to participate in this program, please contact: Brittnay Haag, Extension Horticulture Educator - Livingston, McLean, and Woodford at (309) 663-8306 or email her at bhaag@illinous.edu.